Do you want to become a chef with the foundational knowledge to make nutritious food taste great? Or a nutritionist who knows how to cook? Position yourself on the leading edge of 21st-century food, health and social responsibility through JWU’s first-of-its-kind Culinary Nutrition bachelor’s degree program. This program features a unique blend of academic and lab-based culinary arts, nutrition and professionally related coursework, which prepares you for a growing range of in-demand career opportunities. Devise appropriate wellness education programs for a community, worksite or public health environment. Become a chef for a restaurant, professional sports team, spa, school or healthcare facility, or start your own private chef business — one whose focus is on healthy food, nutrition, and preparation techniques. You’ll learn about culinary fundamentals, applied nutrition, life span nutrition, specialized topics and more in a curriculum focused on improving the way people eat. Then you’ll apply your knowledge in a professional internship or summer term abroad during your senior year. When you graduate, you’ll be ready to create, modify, manage and prepare specialized cuisines in any arena where food and nutrition blend into a healthy lifestyle — making a difference in the lives of many. NOTE: This program is a 2+2 program, meaning that you will complete your associate in applied science degree in Culinary Arts before entering and completing the bachelor of science degree in Culinary Nutrition. Johnson & Wales has submitted an application to the UNC Board of Governors for a license to offer the Culinary Nutrition 2+2 degree program. Approval of the degree program is pending the outcome of the review. 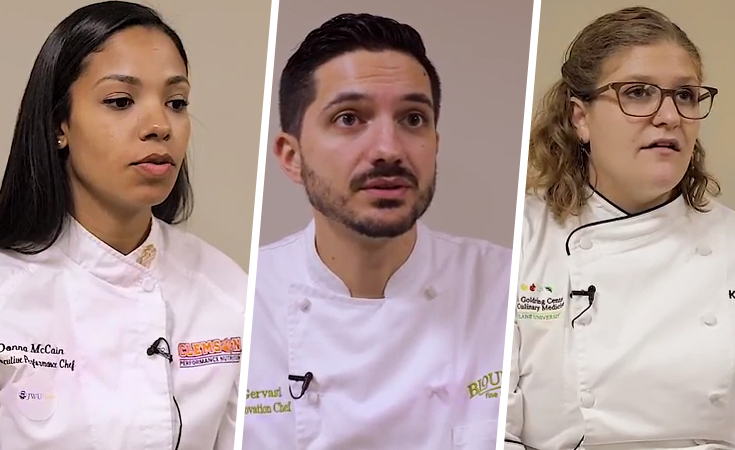 In this video series, 10 prominent nutrition alumni share how JWU set them up for success, as well as their top tips for going far in the industry.